Household pianos are best when tuned at least twice a year. 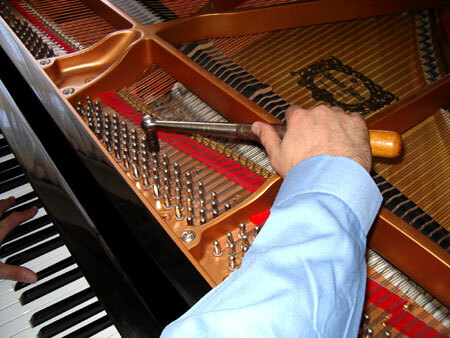 All pianos require tuning from time to time for a variety of reasons. Even if your piano does not get much use, a piano can go out of tune due to such factors as instability of temperature and humidity. How often a piano should be tuned depends on the usage of the individual piano. In the Canadian summer climate, when humidity rises, a piano will rise in pitch. During the winter, when humidity is low, a piano will drop in pitch. A Piano should always be tuned to standard concert pitch (A-440). As a piano owner, you should know that instruments left untuned for over a year are likely to have dropped below concert pitch and will require a pitch raise. In this case, a piano has to be tuned more than once to bring it up to pitch.